Soyuz 11A511 Stage 2 engine displayed at Tsiolkovskiy Museum in Kaluga. 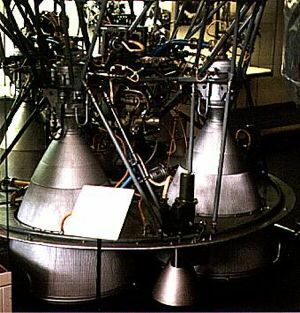 Kosberg LOx/Kerosene rocket engine. Soyuz 11A511, Molniya-M 8K78M. 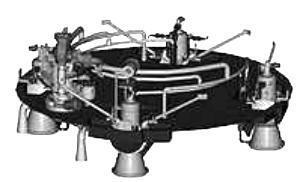 Precursor RD-0107 used in 11A57 Voskhod stage 2. Modified to increase reliability. First flight 1964. AKA: 11D55;RD-461. Date: 1964-69. Number: 1136 . Thrust: 297.90 kN (66,971 lbf). Unfuelled mass: 408 kg (899 lb). Specific impulse: 326 s. Burn time: 250 s. Height: 1.58 m (5.18 ft). Diameter: 2.24 m (7.34 ft). Chambers: 4. Engine: 408 kg (899 lb). Chamber Pressure: 68.20 bar. Area Ratio: 82.2. 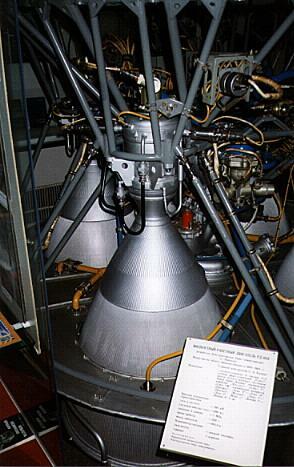 Propellant Formulation: Lox/RG-1. Thrust to Weight Ratio: 74.46. Oxidizer to Fuel Ratio: 2.2. Country: Russia. Launch Vehicles: Soyuz 11A511, Molniya 8K78M, Soyuz-U, Soyuz-U2, Soyuz M. Propellants: Lox/Kerosene. 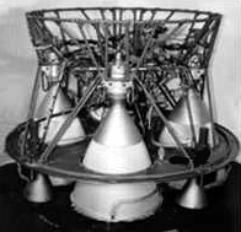 Stages: Soyuz 11A511-2, Soyuz 11A511U2-2, Molniya 8K78M-2, Soyuz 11A511U-2. Agency: Kosberg bureau. Bibliography: 177, 225, 226, 307, 320, 403, 95, 7467.